Shingles Vaccine - Side Effects, Cost and Age. 2 What is Shingles Vaccination? 3 What are the side effects of Shingles Vaccine? 4 How much does the Shingles Vaccine cost? 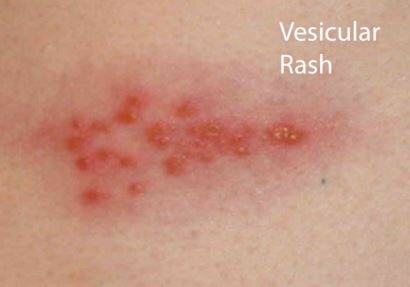 Shingles also known as herpes zoster, is caused by a virus that results to a painful skin rash. The varicella-zoster virus that causes chickenpox is the same virus that causes shingles; so if a person already had experienced chickenpox, then that person could possibly get shingles mainly because the virus does not completely go away. Rather, the varicella-virus remains dormant and is awakened again once a major stressor, diseases, or aging of the body but once it’s active again, it results to shingles and not chickenpox. Shingles appears usually in a band, strip, or skin rash on a certain area of the body that later on become blisters in a small cluster. The most common symptom of shingles that might be quite painful is a bad rash on the skin. Other symptoms include; bruised feeling on a certain side of the body, chills, irritated stomach, tingly and itchy skin that later on develops to a set of small swelling bubbles filled with fluid on the inflamed skin, a stabbing pain, extremely hot feeling, and being burned deeply. The eye sight can be affected by shingles causing severe pain and the worst case is the loss of vision. This might then turn into some other serious problems that could last a very long time or either occurs once in a while, but could possibly be prevented by shingles vaccine. ZOSTAVAX is a vaccine that could help prevent having shingles in the future. If the person had a history of shingles, the vaccine is still recommended according to the CDC for the protection of having shingles again, because shingles can recur more than once. Postherpetic neuralgia (PHN) is a problem of shingles that could be too great to bear from the pain emanating caused by the affected nerve commonly encountered on shingles which lasts for up to a month and may sustain for years if not prevented right away. Although the vaccine could be taken at the age of 50, CDC does not recommend it unless the person reaches 60 or above. Shingles occur mostly at that age because of the weakened immune system. A few people aging from 50 and below wants to know if they could get the shingles vaccine and according to some physicians, they have the “off-label” vaccine, which is referred to as drugs that are used, but have not been supported by FDA. Shingles vaccination exposes a person with a little amount of the virus in order to develop immunity, but will not treat the virus so the person who had been vaccinated can still acquire shingles or any other infections in the body could not be treated as well. If you have a minor cold, the vaccine can still be taken. ZOSTAVAX is given as a one-time injection into upper arm as single dose unless the doctor says otherwise so there’s no need for a dosing schedule. There is some safety information before anyone can have the vaccine. You are not allowed to have the vaccine if you haven’t had chickenpox. If there’s any allergic reaction to vaccines or its ingredients, ZOSTAVAX isn’t allowed either. Once a woman is expecting to have a baby or if she wants to have one. Any disease that’s untreated like tuberculosis. A cancer that could affect the bone marrow. If a “live” vaccine had been received with the past four weeks. What are the side effects of Shingles Vaccine? Like any other medicines, ZOSTAVAX still have side effects but the risk of extreme side effects is low. The most common side effects of ZOSTAVAX are; redness of the skin, bruising and itchiness at the injected part, lump, headache, and swelling. Experiencing some of these possible side effects is better than to not have the vaccination at all. Millions of people get shingles every year and still keeps on increasing in number. Some may have second thoughts whether to get the vaccine or not because of its cost that’s about 200$, which by the way is covered by Part D Medicare Plans but not the Part B. It means that the next dose will be covered by the person who is required to take it once more which is pretty much expensive. After taking up the shingles vaccine as some sort of protection, less assurance is still given that it won’t resurface once again, depending on the immune system whether it’s strong enough as a shield or weak enough to trigger the herpes zoster once more. Each person differs in many ways and every single one has their own methods of managing their lifestyles, so if the lifestyle’s healthy then all is well. American Academy of Pediatrics (2006) Active Immunization. In: Pickering LK (ed.) Red Book: 2006. Report of the Committee on Infectious Diseases. 27th edition. Elk Grove Village, IL: American Academy of Pediatrics, pp. 9-54. Oxman MN, Levin MJ, Johnson GR et al. (June 2005). “A vaccine to prevent herpes zoster and postherpetic neuralgia in older adults” (PDF). The New England Journal of Medicine 352 (22): 2271–84.